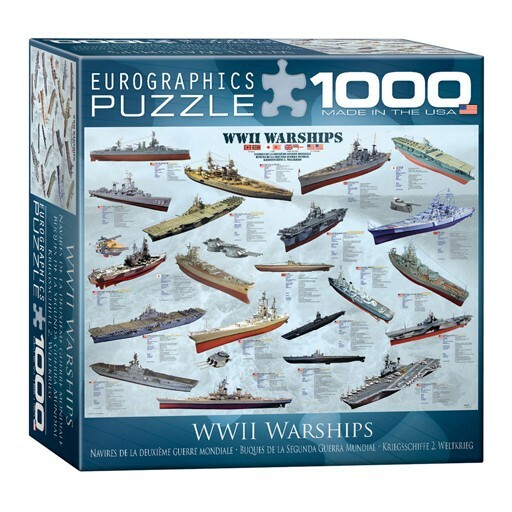 EuroGraphics WWII War Ships 1000-Piece Puzzle (Small Box). Box size: 8" x 8" x 2.37". Finished Size: 19.25" x 26.75". US, British, German and Japanese World War II warships are depicted along with vital information such as class, type, launch date, years of service, fate and general specifications. Includes such famous warships as the USS Arizona, the USS Texas, the IJN Yamato and German Bismarck. Strong high-quality puzzle pieces. Made from recycled board and printed with vegetable based ink. This superior quality puzzle will delight and educate all at the same time.